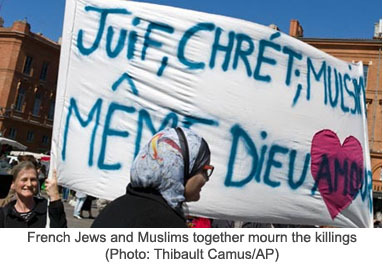 France is home to the largest Jewish and Muslim populations living side by side outside of Israel, with approximately 4-6 million Muslims and a rapidly dwindling 5-600,000 Jews. This spring I am teaching a course called “Jews and Muslims in France” (a light topic…) at a small private college in New England. As I am preparing the course schedule – what books to read and films to see and in what order – I worry about keeping a balanced syllabus. I hesitate; perhaps it’s not necessary to show the film about the grisly gang kidnapping and murder of 23 year old Jewish Parisian Ilan Halimi in 2006? One NY Times film critic called it full of melodrama. That means things like “sensational,” “exaggerated,” and “appealing to emotions.” Who wants to use that as a teaching tool? Teachers are supposed to be objective and cool-headed. For a moment after I read the review, I thought, maybe this film is just too much and not really relevant. Too “Jewish,” too victimizing, and too focused on the gang of a sick, twisted and motley crew from the Paris projects known as the Barbarians who committed the heinous crime. It matters to me that students will read and watch varied stories about how immigration to France by North Africa’s Jews and Muslims since the 1960s has not been a walk in the park for either group. How, sometimes, they have co-existed quite well in various neighborhoods within schools, shops, restaurants and cafes, and other times, it has been tense, complicated and as we know too well, violent. This waxing and waning has been deeply affected by a complex set of catalysts: among them the baggage from the colonial era and of the arduous process of decolonization; by social inequality in France, and of course by events in the Middle East as they radiate out into the world and are adopted as personal battles by disenfranchised Muslim youth as well as by French Jews in their support of Israel as a Jewish homeland. Preparing to preview the French film 24 Days based on the tragic Halimi affair, I again thought about the voice of the reviewer and how it annoyed me with negative comments about “screaming women and worried looking men” and her questioning about why we don’t learn more about Ilan’s father’s estrangement from the family, as if this is critical information in understanding the profundity of the human drama portrayed: loosing a child. And then there’s this: “Even Ilan’s mother (Zabou Breitman), whose viewpoint we are sharing and who directly addresses the camera, emerges as little more than a tireless advocate for exposing the anti-Semitic motivations of the crime.” Imagine that. Little more, melodrama and screaming women. Everything that happened to Ilan Halimi happened to him because he was Jewish. He was targeted as a Jew, not as a Frenchman, nor as white, or European. A Jew. Thank goodness for Ruth Halimi’s courage and fortitude to have written the book and taken on the burden of “exposing the anti-Semitic motivations of the crime.” Had the French Police and justice system not delayed and resisted recognizing this evident fact, perhaps Illan might have still been alive. But then I watched the film, and I made up my mind. Every time a woman screamed (Ilan’s mother, sister or girlfriend) I screamed with them. It felt as though my guts thickened my throat. Yes, indeed the film was a dramatization of a real life event, but if the character who played Ilan’s mother had stood in the Paris streets and screamed her guts out while pulling her hair out and clawing at her face, or been lying in bed in the fetal position whimpering while drugged up on valium, I would think it a more accurate depiction of how a mother could and should have the right to react in a situation like this. Can you imagine exaggerating when portraying a mother who knows her son is being tortured for 24 days and then finds out he is killed. Eventually exhuming his body from the Parisian cemetery to bury him in Israel in order for him to rest peacefully, preventing the criminals from spitting on his grave when they are released from jail. Alive and free to be with their families, with their mothers. I can’t imagine how to exaggerate portraying this experience. Although the Barbarians were a motley crew from diverse backgrounds, the leader, Youssouf Fofana, was a Muslim from the Ivory Coast, who made the more than 600 terrorizing phone calls to the Halimi family during the ordeal, and played Quranic verses into the phone. This is also part of a reality. So, my students will see the horror of a most despicable anti-Semitic crime. But they will also read stories and see films depicting Jews and Muslims coexisting, co-operating, helping each other and even romantically involved. These are all scenarios part of the complex reality between Jews and Muslims in France since the 1960s, and as an educator I hope to open minds and encourage discussions on this timely and often difficult topic.